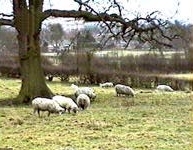 The Wathen Family comes from the Frome River (Stroudwater) Valley in the Cotswolds---a range of low hills in Gloucestershire County that some call the "Heart of England". These hills became famous in the Middle Ages for a high-quality wool from the Cotswold Lion, a local breed of sheep, and Cotswold shepherds made England the largest exporter of raw wool in all of medieval Europe. However, as water-driven mills in the Frome Valley were slowly converted from grinding wheat to running spinning wheels and weaving looms, all of the wool was used locally to make cloth, as more money was to be made exporting the cloth than from selling the wool itself. As a consequence, Stroud became the center of the British cloth industry, Cotswold wool being all but forgotten, and the local broadcloth brought huge fortunes to the mill owners, allowing them to build stately houses and marry into the nobility. 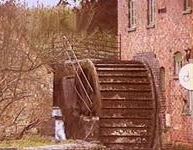 The parishes of Kings Stanley, Stroud and Painswick all had waterwheel-powered mills that supplied the Gloucestershire woolens trade, which during the 1603-1625 reign of King James I came to rival that of Flanders. Although Painswick was the largest town of the three, having had a thriving outdoor market since the 13th century, Stroud was more conveniently located for the water mills, having a better availability of fullers earth with which to shrinken, thicken and dye the cloth. As such, Stroud at an early date became the center of the of the English clothing industry, and the Wathen family became wealthy by running woolen mills on the outskirts of town that employed legions of workers. The early origins of the Wathen family in Gloucestershire are a bit of a mystery. First of all there is a Jonathan Wathen of Kings Stanley (d. 1630), who is listed in Burke's Landed Gentry as the patriarch of the Wathen family of Bolwick Hall (formerly Beckenham Lodge). However, Burkes may actually combine and confuse him with the Jonathan Wathen (d. c.1667) who follows, possibly his son. It is also possible that Burkes has incorrectly identified him, and that the true patriarch of the family, and the father of the aforementioned Jonathan Wathen (d. c.1667), is Phillipp Wathen of Rodborough (d. c.1632), who is discussed below. At this point either scenario is possible. The Jonathan Wathen above is shown in some genealogies as being born about 1570 in Kings Stanley, Gloucestershire, but they provide no evidence. Burkes lists his wife as a woman named Sarah (d. 1637), and gives 1630 as his death date. However, beyond what is shown in Burkes, which is probably based on records in the College of Heralds, nothing else is known. Although his trade is not known, it is likely that he played some sort of role in the Gloucestershire cloth trade, as it rose to prominence during his lifetime. Phillipp Wathen is described in his father's will as the oldest son. He may also be the kinsman named Phillip Wathen of Rodborowe (Rodborough), who is mentioned in the 1667 will of the Jonathan Wathen who follows. Edward Wathen is named in his father's will of 1631, and in his brother's will of 1667, which identifies Rodborowe (Rodborough) as his village of origin. He inherited from his father a manor house and associated property (messuage) known as the Archards (Archers), which is described above. Edward Wathen appears to have had a daughter named Alice Wathen, who was baptized Nov. 16, 1623 in Rodbourgh, Gloucestershire. He also had a son named Phillipp, who is mentioned in the 1632 will of his father Phillipp Wathen of Rodborough. Jonathan Wathen (d. 1667), who follows in this lineage. Elizabeth Clayffields is mentioned in her father's will as the oldest daughter. Margerie Bernarie is mentioned in her father's will as the youngest daughter. Elizabeth Anna Maria Wathen (1807-1867), the daughter of Nathaniel Wathen and Mary Beardmore, was born Nov. 4, 1807 in either Stroud, Gloucestershire or London, and baptized on Jan. 3, 1808 in the Stroud parish church with her sister Frances. Her early years were spent at Stroud and the nearby village of Brimscombe where her father ran woolen mills to make cotton clothing, but when she was a little girl, her parents moved from this rural setting to central London, and there she grew up. When she was 23-years old, she married Theophilus Thompson (1807-1860), an eminent London physician, on Jan. 25, 1831 at St. Pancras Church in the Camden parish of the City of London. The marriage was probably arranged by her father and Theophilus' older brother Thomas Thompson. Given that both Nathaniel and Thomas were prominent members of the British Foreign Bible Society, and that both men were famed for their piety, as well as their philanthropy, they no doubt shared similar views, and were probably good friends. There is no question that Elizabeth and her husband Theophilus both came from wealthy families, and as Theophilus was one of London's most respected doctors, they must have lived in great comfort. Elizabeth lived the rest of her life in London, and after raising a family of several children, she died on Nov. 14, 1867, a few days after her 60th birthday. The photo on the right, though not formally identified as Elizabeth Wathen Thompson, came from a small brass locket that also contained a very well-known photo from the National Portrait Gallery (London) of her husband Theophilus Thompson, and it is believed that this locket was carried by their son Theophilus Wathen Thompson, which makes it likely that the photo is indeed of Elizabeth. Please see the Thompson Genealogy for the children of Elizabeth and Theophilus. Samuel Wathen (c.1699-1730), the son of Jonathan Wathen, was born in Kings Stanley, Gloucestershire, and baptized there on May 28, 1699 in the parish church . He married Sarah Burns on April 7, 1724 in Minchinhampton, Gloucestershire, and had several children, including the son who follows. He died on Oct. 2, 1730 and was buried with five of his children in a tomb in the churchyard of the old St. Laurence Church in Stroud. However, it is not known if his tomb survives, as many monuments were not saved when the old church in 1869 was torn down and the new one built. Samuel Wathen (1723-1786), the son of Samuel Wathen and Sarah Burns, was born in 1723, and married Elizabeth Paul on Sept. 3, 1745 in Gloucestershire. A family bible owned by descendants in Australia shows that Elizabeth died on March 14, 1749 at the age of 43 years, and she is buried in St. George's churchyard in Kings Stanley. Samuel died on Jan 28, 1786 in Whaddon, Gloucestershire, where his tombstone is to be found in St. Margaret's churchyard. Elizabeth Wathen was born June 8, 1746. John Wathen, Jr. (c.1705-1744) of Picked Elm Farm, the son of John Wathen, Sr. and Rebecca, was probably born about 1705 in Kings Stanley, as he was baptized there on Nov. 4, 1705 in the parish church. He received Picked Elm Farm from his father upon his marriage in 1737 to a woman named Susannah (c.1701-1797). He died on Oct. 19, 1744, predeceasing both his parents, and he is buried with them and his wife in the family tomb at the Kings Stanley parish church. Susaanh survived John by more than 50 years and died on Nov. 21, 1797, when she was 96 years old. She is buried in the same tomb with her husband. The eldest son of John and Susannah follows.